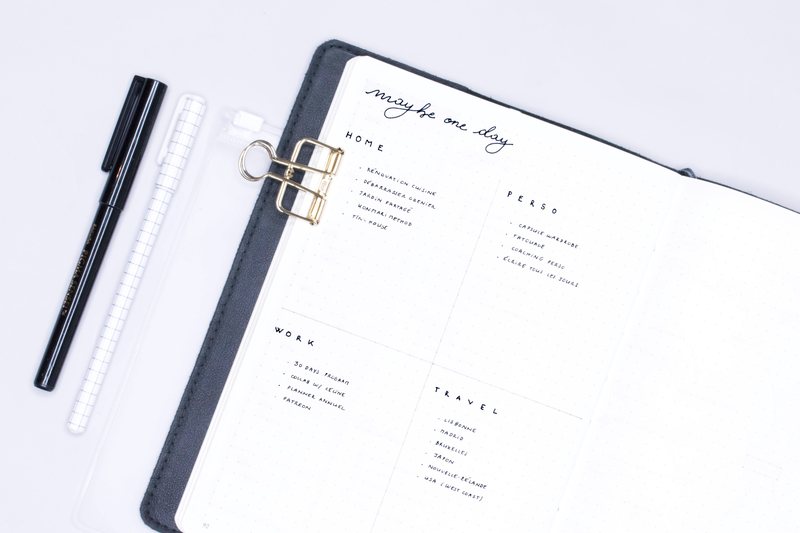 Last August, I was sharing some thoughts about how to combine David Allen’s Getting things done method with the bullet journal. I’m back with the second part of this post. 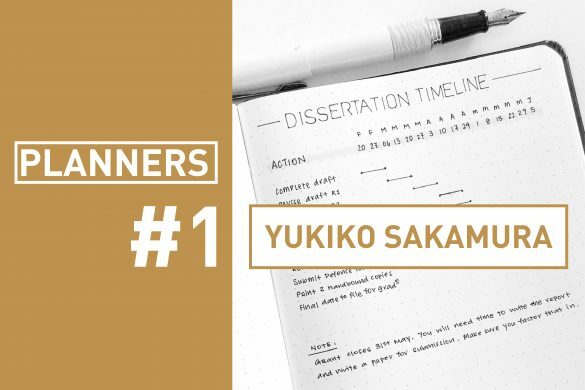 If the first one is focusing on how I was using GTD in addition to my bullet journal, this new post will all be about spreads ideas. The bullet journal and the GTD methods are working great together. So here are a few examples of spreads you can use to better manage your projects and tasks in your journal. If you’re not familiar with the Getting Things Done method just yet, go read the first part of this series of 2 posts here. You can also find everything about the method in David Allen’s book simply called “Getting Things Done”. The first step of the GTD method is to capture all the items that have your attention at the moment. Aside from what’s in your various inboxes, you probably have a lot in mind that you’d like to capture in one place as a basis to sort things out. 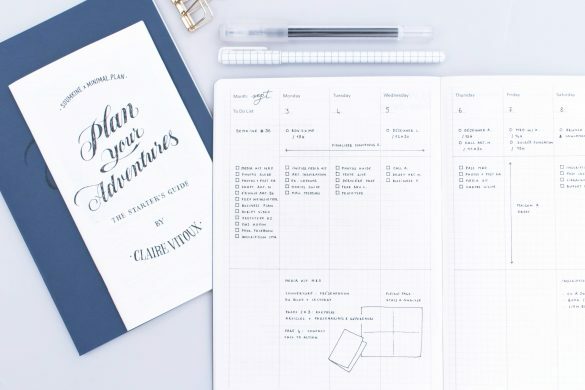 Your bullet journal can become a space to do that. There are plenty of ways to do that. One of my favourite is to draw a mindmap. 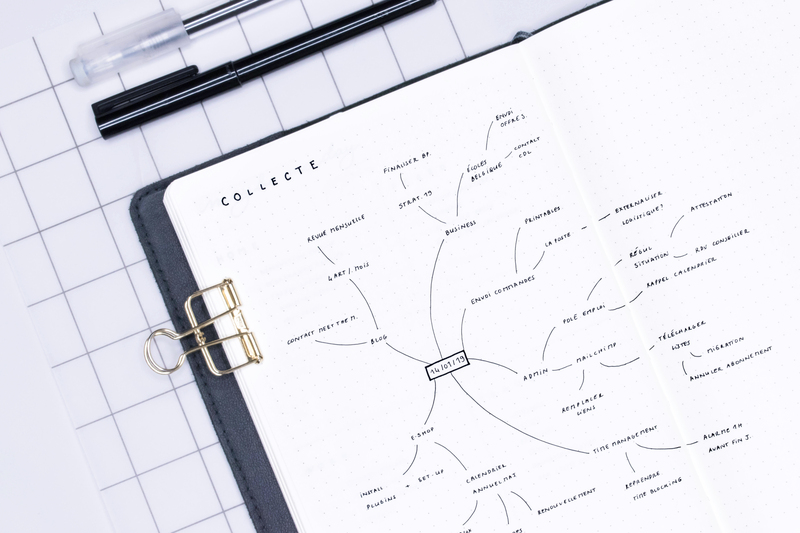 Creating a mindmap can be a great way to do a braindump that will allow you to organize the items a they come up. Start by putting the date of the current day at the center of your spread. Then, you just create branches as you empty your brain from all the tasks and projects that have your attention. After you’ve captured and clarified all the items that have your attention, it’s time to structure them and engage action! 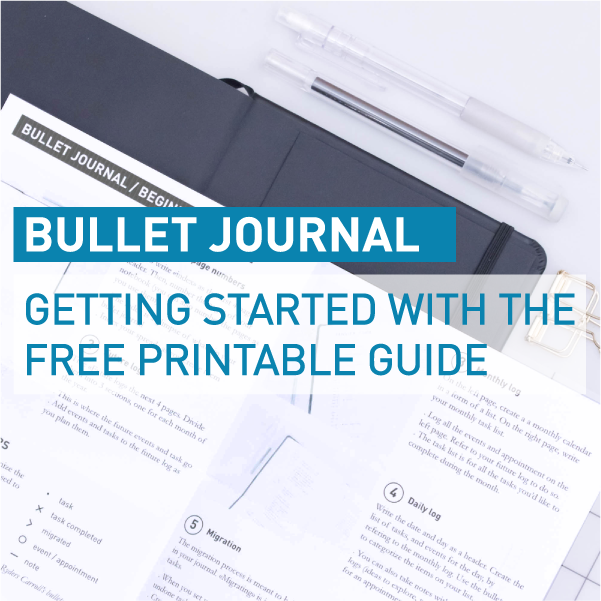 Once again, your bullet journal can easily be hacked to integrate the GTD method to your regular journaling practice. 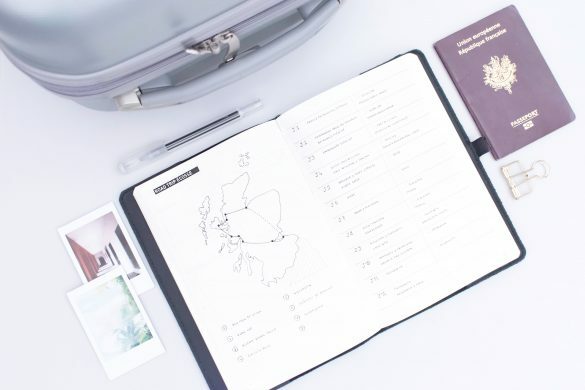 Here are some ideas of bullet journal spreads layouts that you can borrow or take inspiration from to build your own bullet journal + GTD ideal combo. That’s a spread that I’ve already featured on the blog, but that was ages ago! It perfectly fits the GTD method principles. 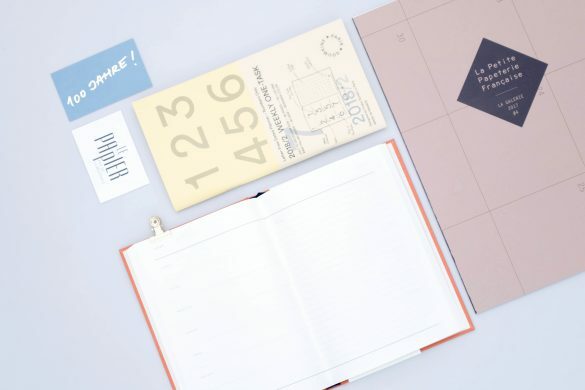 On a double spread, draw a table with : 5 or 6 columns (depending on the number of weeks in the month you’re planning for) and as many lines as you need to list your current projects. List your projects in the left column and number the spare columns with the week’s numbers. Use the boxes to plan your next actions, according to David Allen’s Getting Things Done method. 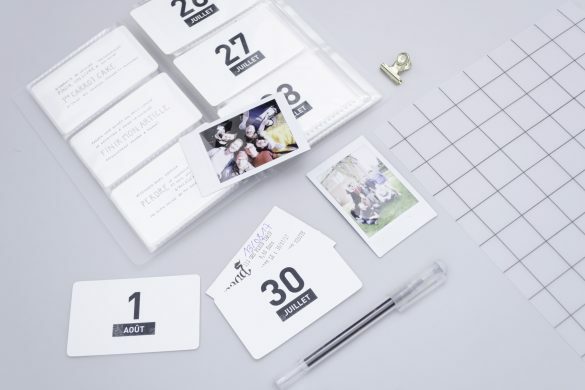 Planning this way will help you to have a very clear idea of what needs to be done regarding your various projects, and to organize the information so that you also know when you need to do it. 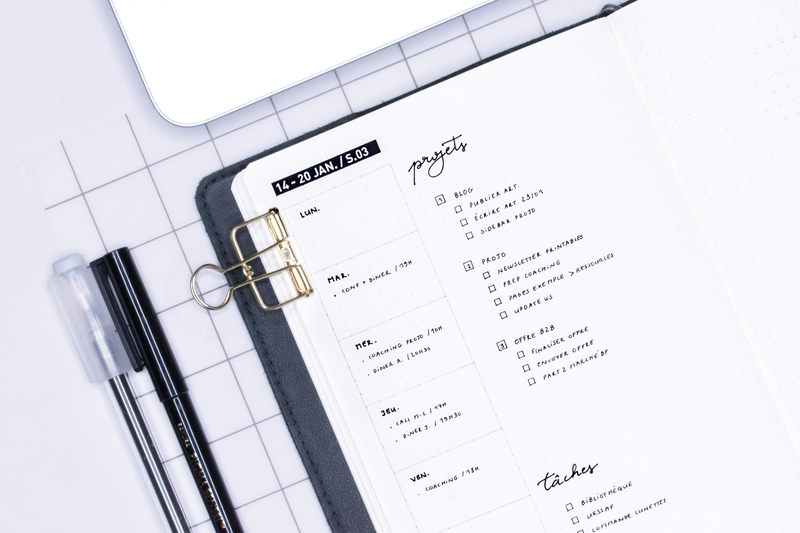 My advice is to go to this spread at least once a week, review the column for the current (or past) week and review the task lists to mark the tasks you’ve done as closed, migrate the tasks that are still open and decide on your next actions for each project. 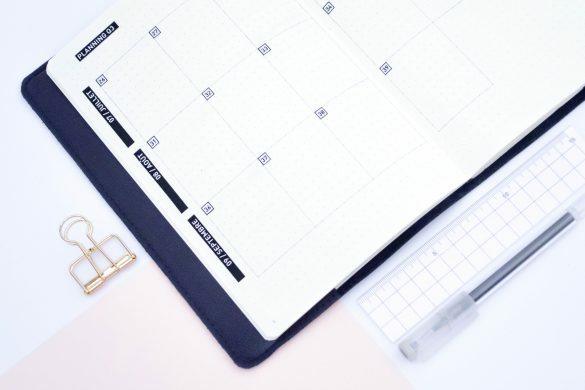 Having a monthly overview of your projects is great to plan and see where you stand, but you may want to have your projects and task lists on hand on a daily basis. If you’re using a weekly dashboard, that’s definitely the place where you can integrate your projects to check on them everyday. 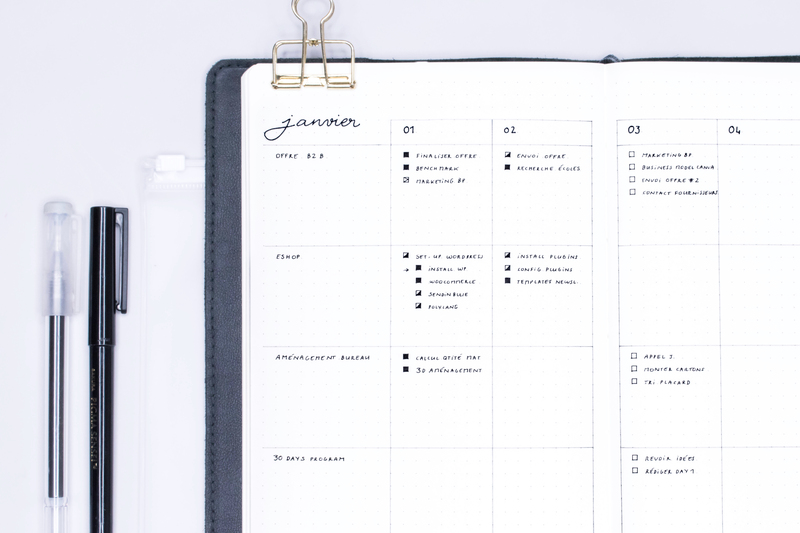 There are 2 ways to integrate projects in your bullet journal weekly log. 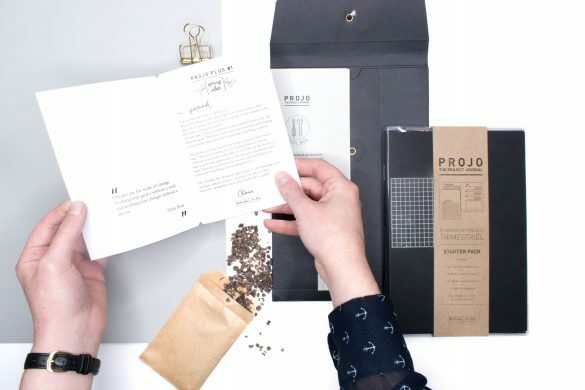 The first one is to simply create a list of your current projects, as a simple reminder of the projects you’re running at the moment (even the ones that are paused because you’re waiting for some information or for someone else to take action so that you can move forward on your side). The second option is to create a list of the projects you’re currently running, and make a weekly task list for each of them. It’s basically the same thing as the monthly action plan above, but on a weekly basis. I personally prefer to have a solid task list per project in my weekly dashboard, even though it means having the same tasks in my monthly and weekly spreads. Having a projects section in my weekly dashboard is really helping me to take action and better track progress on my projects. 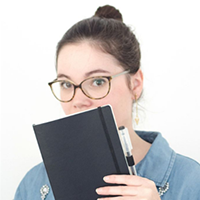 Either way, I strongly recommend to integrate your projects to your bullet journal weekly log so that you can have an overview of the projects you’re involved in. 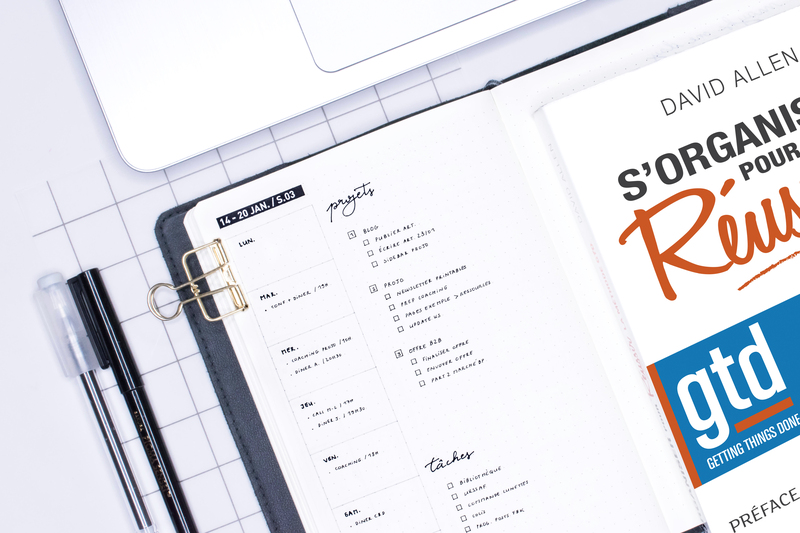 If the list is starting to grow madly and you feel a bit overwhelmed, it’s maybe time to review your commitments and make choice to declutter your schedule (and your brain at the very same time). Among all the items you’ve collected, you probably have some non actionable items that will go in a “maybe one day” list. 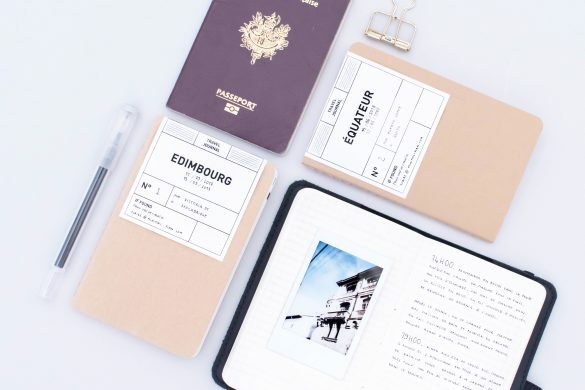 You can typically store this list in your bullet journal in a form of a collection. Of course, you can go with a super simple and straightforward list here. 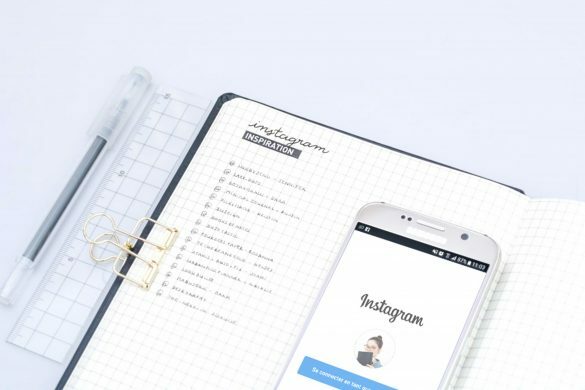 You can also choose to organize your “maybe one day” items by categories: work, home, travel, self growth, family… (you can get inspiration from the Level 10 life guidelines to identify life areas and the corresponding categories if you’re struggling there… or just gather the items by category yourself). Simply split your spread in as many sections as categories you have. Then, list your “maybe one day” items in the sections you created. Make sure to leave a margin on the left so that you can add bullets and signifiers eventually. This way, you’ll be able to easily identify the projects that are important or the ones you migrated to an other collection for instance. The last step of the GTD process is the review of your system. It’s very close to the migration process of the bullet journal method. 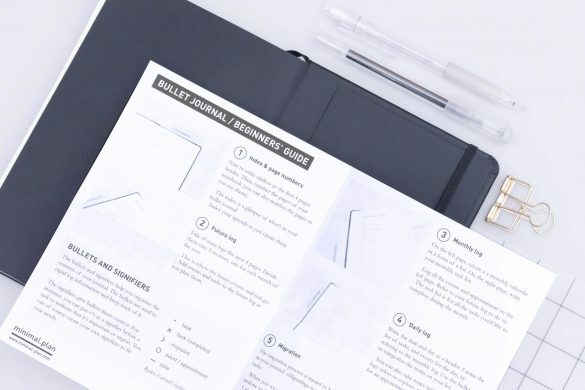 If you’ve implemented the GTD process to your bullet journal practice, the review will help you to assess progress and update your entire organization system. 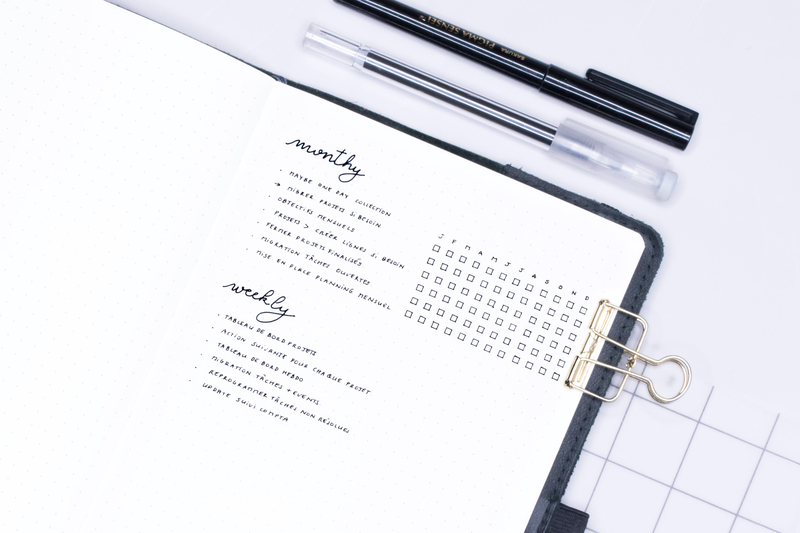 To make sure you make a complete review of your system without missing anything, I suggest to create a checklist collection in your bullet journal. You can put it at the beginning or at the very end of your notebook for easy future reference. This spread doesn’t really need any specific layout. Just make sure that you list all the steps of your review process. If you want to keep track of your progress and make sure that you don’t skip any step, you can set it as a tracker. Of course, these are just examples of how you can integrate the Getting things done method to your bullet journal. There are an infinite ways to combine the two methods. It’s now up to you to imagine the perfect combo to serve your very own needs!